Quilting was a popular form of needlework in the 18th century. Both decorative and practical, it was used on clothing and furnishings such as bedcovers and hangings. 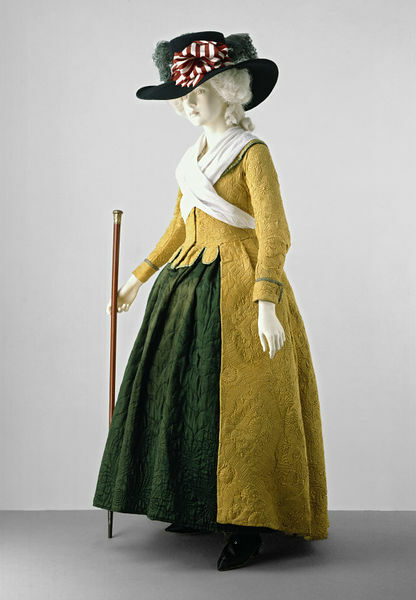 Quilted furnishings were often remade into clothing, as in this particular gown. The pattern of the quilting indicates that it was done in the mid-18th century. 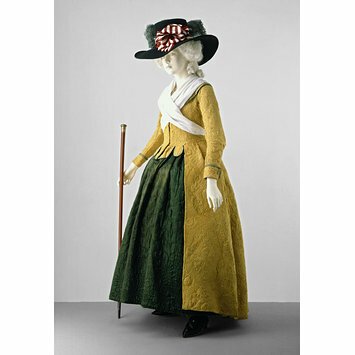 The style of gown dates from the 1780s, which shows that it was refashioned into clothing some thirty years later. This would have added a warm, attractive winter gown to a woman’s wardrobe, without buying a new one. A woman's gown of yellow silk satin, quilted and corded in a design of interlaced ribbons, with flowers, leaves and scrolls. The gown is in the English (tight-back) style, open at the front. It has long, wrist-length sleeves, curved and cut in two pieces, with buttoned, turned-back cuffs. The gown is unlined. The bodice meets at the centre front, with lacing bands of coarse linen and 8 worked eyelets on either side. There is a round flat collar at the neckline, lined with coarse linen, and two shaped laps (tabs) at the lower edge of each bodice front. The pleats are stitched at the back. The skirts are made in 3 pieces and flat-pleated into the waist seam, which runs from the front opening to either side of the centre back pleats. The lower edge of the bodice, the sleeve cuffs and collar are edged with green silk ribbon. The gown was probably made from a coverlet, with the front edges of the skirt and bodice fronts preserving the border decoration. The sleeves and collar are heavily pieced. A Conservation lining of white crepeline has been added to protect the worn underside of the quilting.